CARBONDALE, Ill. -- The newest addition to Southern Illinois University Carbondale’s aviation technologies program will be an invaluable resource for students in aircraft and avionics maintenance training. The program on Tuesday received a U.S. Navy Gulfstream III C20A once used to transport military leaders in Europe and Africa. Built in 1982, the aircraft has more than 21,700 hours and while it was flown to the Southern Illinois Airport, the military plane is for ground use only and not flyable. Michael Burgener, department chair, said while the jet, with two Rolls Royce engines, is fully operational it will be used to train aircraft technicians on the ground. The program has approximately 170 students, and each will receive training on the Gulfstream at some point, he said. The jet will be particularly useful in advanced maintenance and avionics. 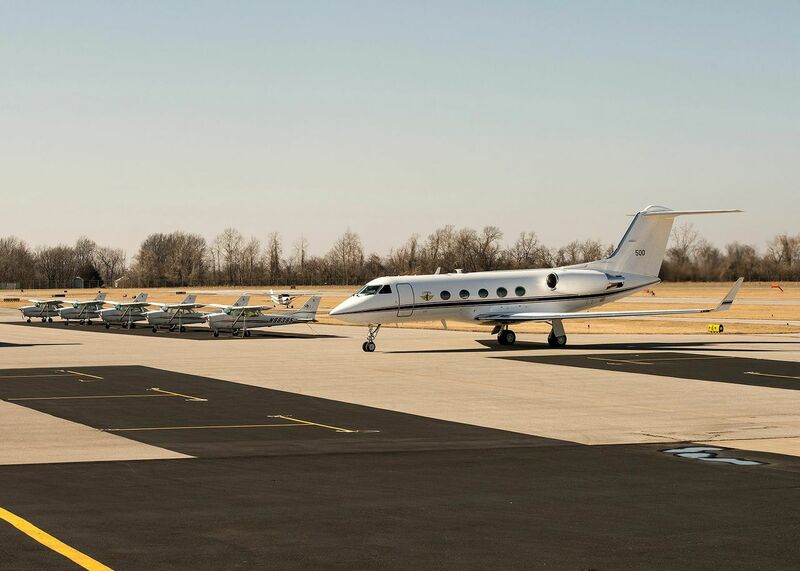 Burgener added that there are two large aircraft repair organizations within 100 miles of the university in the Metro East area, and that both, Jet Aviation in Cahokia and West Star Aviation in East Alton, hire SIU Carbondale graduates and have programs to maintain Gulfstream jets. “This donation allows us to train our students using the exact same aircraft they will encounter after they graduate in our maintenance training program,” Burgener said. The Navy used the aircraft and others like it to transfer leadership, including the Chief of Naval Operations, the Secretary of the Navy and other command personnel to the U.S. Military Headquarters for African operations, or AFRICOM. The jet, “Catbird,” which would cost more to repair than it is worth, was part of an executive transport detachment out of Naval Air Station Sigonella, Italy. “Being an SIU graduate and a naval aviation maintenance officer, the Navy’s donation of this aircraft to SIU is special to me. Although its days with the Navy are complete, there’s still life in that aircraft and I’m pleased to see it go to a great school where students will be able to train on the actual aircraft they might find themselves working on after graduation. I’m proud to represent the Navy with the donation of this aircraft,” said Capt. BC Young, deputy chief of staff for aviation maintenance. The jet will be a “great addition to the instructional resources” within aviation technologies, Andy Wang, dean of the College of Applied Sciences and Arts, said. He emphasized the importance of the students gaining hands-on experiences with different types of aircraft, including the Gulfstream. The program’s current variety includes a commercial Boeing 737, another military jet, and a Learjet, in addition to small single-engine and twin-engine piston airplanes and helicopters. Because the Gulfstream jet was primarily used for distinguished visitors and government and military officials to travel around the world, Wang notes it supports “a communications suite which supports worldwide secure voice and data communication.” The electrical system and avionics package “will be invaluable for our AVT students in avionics training,” he said.